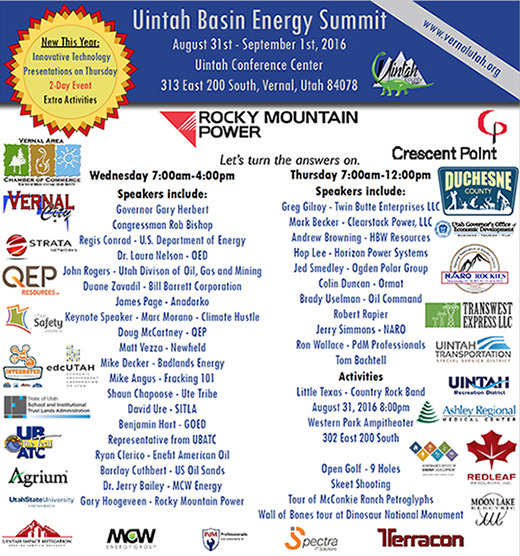 Sept. 2, 2016 – As part of its ongoing energy-related collaborations and conversations in Utah, TransWest Express LLC was among the sponsors of the Uintah Basin Energy Summit for the second consecutive year. Held Aug. 31-Sept. 1 in Vernal, the Summit brought together members of the energy community and local citizens to “enjoy world-renowned speakers as well as local updates and insights into the energy industry affecting the Basin.” About 100 miles of TransWest’s proposed TransWest Express Transmission Project, a new HVDC electric transmission line designed to improve reliability and resiliency of the western U.S. power grid, will be built in Uintah and Duchesne counties and will be primarily co-located next to an existing transmission line to minimize environmental impacts. Event speakers included Utah Governor Gary Herbert; Dr. Laura Nelson, executive director of the Governor’s Office of Energy Development; Shaun Chapoose, chairman, Business Committee, Ute Indian Tribe of the Uintah and Ouray Reservation; and others across government and energy sectors. TransWest representatives participated to share information and answer questions about the TWE Project and its benefits to Utah, including being designed to provide for an interconnection at the Intermountain Power Plant and its transmission system near Delta. In addition, the TWE Project will facilitate access to diverse renewable energy resources across the west. TransWest also sponsored the 2015 Uintah Basin Energy Summit, held Sept. 10 in Vernal.